This past weekend Eddy (standing on right), one of Brian’s workmen at Industrial, invited us to come and show the JESUS film at his village and to spend the night. We agreed to give Eddy and his family a ride. 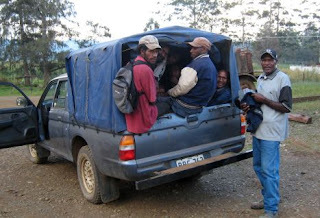 When you agree to give a ride to a Papua New Guinean and his “family”, you can pretty much bet that they will keep piling people in until it isn’t physically possible to fit more. A few guys didn’t make it into our truck, but they cut across country on foot and made it to the village about the same time we did by road. We didn’t get an accurate count, but there were five people and a baby in the cab, plus another 5 or 6 crammed in the back with all of our equipment. Our truck was “pulap tru” (full-up true).